My wife got me a copy of Hotel Samoa for Christmas and I’ve finally been able to get it to the table enough times to write a bit about it. Players represent hotel chain operators vying to attract tourists to stay in their hotel. Those that attract the best tourists, for the best room price, for the most efficient amount of time, in the most enhanced hotel will earn the most money and will therefore win. The game was designed by Kristian Roald Amundsen Østby and supports 3-6 players with a playing time listed at 45 minutes (our games lasted much longer). Twelve large placards depicting four countries, are randomized and placed in a line in the center of the table (each group of four nationalities has a little number depicting which group it belongs to 1, 2, or 3 and each group of four tiles is randomized). Each player chooses a hotel chain and receives a hotel placard, a deck of cards matching the hotel chain and some starting money. Starting at one end of the twelve nationality placards, the game lasts twelve rounds with each round focusing on the tourists depicted on the placard. Each round tourists of the specific nationality depart (leave the hotels) and new tourists arrive to be housed in the hotels. At the beginning of each round, an action card is flipped up that depicts in the left hand column, the number of players, and in the right, the number of tourist groups and number of tourists in each group that have arrived in that round. The card (depicted on the left hand side of the image) shows that for 6 players, two groups of tourists will arrive: 1 group of size 5 and another of size 2. 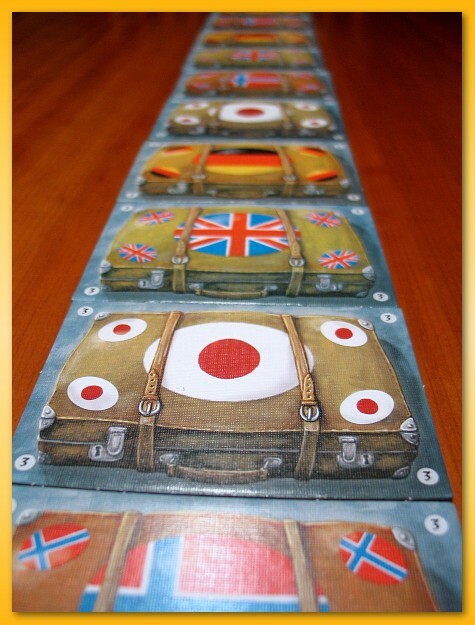 Tourists (the little round discs with the matching flag/suitcase) are selected in the appropriate numbers, grouped as specified by the card, turned face up (flag down), and an appropriate number of “build” tiles are flipped up (shown to the right of the “action” card above). Each round, players select a card from their personal deck, place it face down in front of them and when all are ready, the cards are flipped up for all to see. Each card is divided horizontally with the top half representing a “build” cost, and the bottom representing a “room” cost. Starting with the player who played the highest “build” card and passing to the lowest build card, players are offered the option of purchasing one of the “build” tiles flipped up for the round. If they pass, the player with the nearest lower “bid” is offered a tile of their choice. 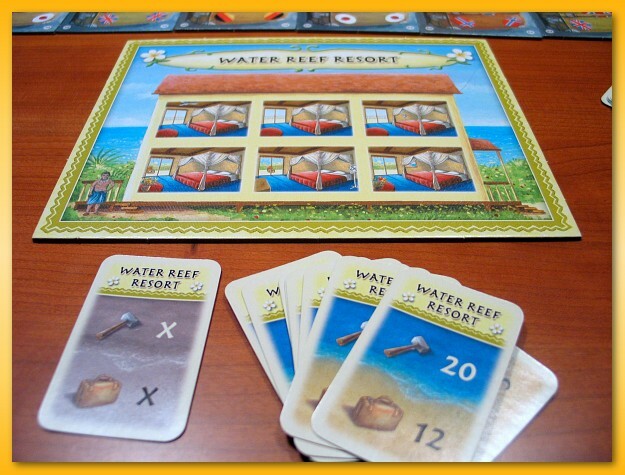 Build tiles represent upgrades to the hotels (e.g. pools, extra rooms, suites) as well as special tiles that let players deviate from the standard rules in some way when they discard the tile (kick out tourists, swap cards, etc.). After the build tiles are purchased, players resolve the room costs in reverse order lowest to highest. The room cost is the amount of money the hotel is charging for a room (one tourist per room) and when players are offered the chance, they can choose to take as many tourists from any one group and place them in empty rooms in their hotel and receive the money from the tourist. This is the only way to make money in the game. Of course, there’s a tight balance with knowing how many tourist to house in your hotel and of what nationality they should be given that the tourists don’t leave the hotel until the appropriate plane arrives bringing that nationality back to the island. Fill up your hotel too quickly and you may be stuck for awhile until an appropriate plane arrives. If you’ve used your card to either buy a build tile or house tourists, you don’t get to use it again. If you didn’t get a chance to use your card or you chose to pass, you get to pick the card up and use it on a subsequent turn. Every player is given a special card that is always picked up when played: the “pass” card (shown on the lower left.) 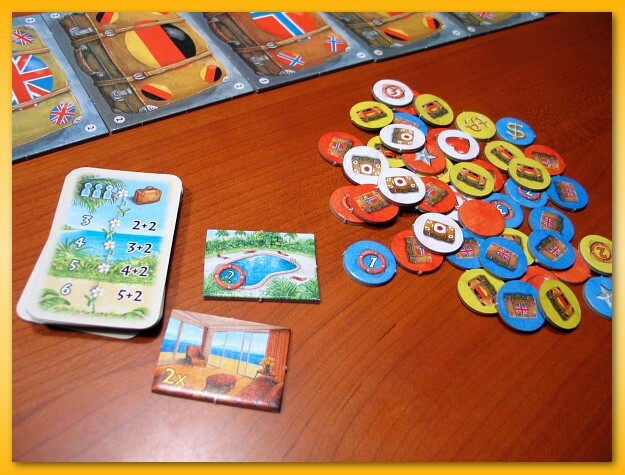 When played, the player cannot buy a build tile or house any tourists this round but they do get to kick out two tourists from the hotel. That’s basically the game from a high level. Tourists come, tourists go, players “bid” using cards for the ability to upgrade their hotel and bid on housing tourists in hopes of making the most money. There are numerous other rules that keep things spiced up including different kinds of tourist which cause different amounts to be paid (e.g. celebrities, swimmers, rich people, lovers, etc.). Overall, the game is okay although a bit repetitive. There is interaction between players but the rather mundane tie-breaking mechanism for matching bid cards is a bit prescribed. Each round plays out relatively like the last and there isn’t a lot of thinking that goes in to each play. I’ve played the game with 6 and I don”t recommend it. It played much more fluidly with four and I suspect three would be the most enjoyable. My biggest beef is with the amount of small denomination money provided in the game. Most build cards and room fees require small denominations but we were constantly having to cash in players money in order to cycle small denomination coins back to the bank. Every round crawled while we figured out how to make change…again. I recommend replacing the coins with readily available paper money available or poker chips. First of all, I need to apologize for the lack of posts lately. I’ve got no excuse other than lack of motivation. I’ve sat down numerous times to write, and really wanted to write, but just didn’t have the motivation to dig in. I’ve felt a hesitance to organize my thoughts in anything remotely coherent and, instead, I’ve gravitating towards some light novel reading, browsing the web, social networking, and your basic time killing/wasting activities of the modern networked couch potato. Sorry about that and I hope to get my groove back. Fortunately (or unfortunately depending on your perspective), I’ve not slowed down buying new games so it’s not like I don’t have some things to talk about. So, I thought I’d give a shot at describing a recent addition to my collection, Cities. Matt Evett taught me Cities a couple of years ago at my first GLG and I liked it. I’d looked around for a copy but it seemed out of print and somewhat forgotten. The game was originally published in 2008 by Emma Games and was designed by Martyn F. It gained some notoriety by receiving a Spiel des Jahres recommendation in 2009. A couple months ago I saw that Z-Man games was producing the game using the original artwork by Peter Hermans so I placed a copy on my wishlist and let is stew for awhile until I was sure I wanted to get a copy. As luck (bad?) would have it, an evil friend of mine was looking to get enough games for free shipping and asked if I wanted to order a few games so I caved and Cities was on its way before I knew it. The game, as packaged, allows 1-4 players to compete in gathering the most points placing randomly drawn tiles into a 4×4 square. The game is played solitaire and the most points at the end wins. Add another copy of the game and it scales to 8 cleanly without lengthening play (barring analysis paralysis of course). The game is completely abstract although there has been a light dusting of theme. All players start with the same set of tiles numbered 1-24, and containing various colored quadrants representing water (blue), parks (green), terraces (red), and attractions (yellow). In addition, each player is given 7 meeples. The lead player shuffles his cards and randomly sets aside 8 tiles. The remaining 16 tiles will form the 4×4 grid by game end. The lead player then draws 3 tiles and calls out the numbers on those tiles. Everybody else pulls the same numbered tiles from their stacks and the everybody places their three tiles on the table in front of them such that only the corners touch. Each player can determine how they would like to orient the tiles. This completes the set up and then the game begins. Each turn, the lead player draws a tile and calls out the number and all other players find that same numbered tile. 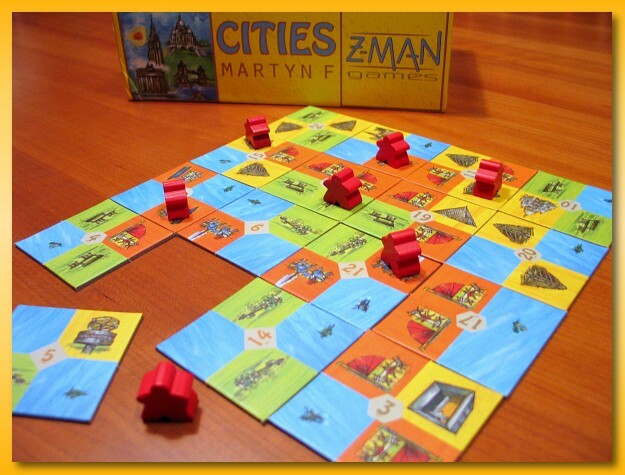 Then all players determine how they wish to orient the tile and then place it in their ever growing “city”. At a minimum the tile must touch corners with another tile or be placed fully aligned with one or more tiles. The maximum width of the city is 4 tiles by 4 tiles so this limits growth in all directions. After placing a tile, each player can optionally place one meeple (from the original supply of 7) or move an already placed meeple onto the tile just placed or walk a meeple one tile quadrant to any adjacent tile quadrant. After the last tile is placed and the final meeple is placed or moved, everyone evaluates their meeple positions for points and the player with the most points wins. Points are awarded depending on what “level” is played but at a highlevel, you get points for meeples standing on clumps of colors and bonuses for specific adjacent colors. For example, if a meeple was standing on a clump of 5 connected yellow quadrants that had 3 orthogonally adjacent red tiles, then the player would score a total of 8 points. A rock/paper/scissors relationship with adjacent colors and the requirement that a meeple stand in the clump to score any points for the clump makes for some relatively anxious decisions during tile placement. To spice things up a bit, terraces (red) don’t score for clumps but, instead, for what the meeple can see while looking horizontally and vertically scoring for all unbroken green and blue tiles that can be spied before hitting the edge of the city (or of course a quadrant of some other color). Overall, it’s a very light game and almost qualifies as an activity rather than a game. The nice thing is that it can be played solo if you’re in the mood for such a thing, games are VERY short, and it’s very easy to teach (although what colors means what and how to score can be difficult to remember at first).